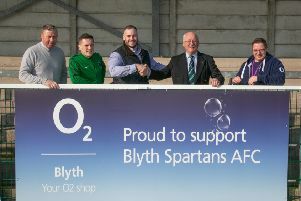 Blyth Spartans boss Tom Wade was pleased to pick up all three points from the 1-0 win against Matlock Town on Saturday. And his pleasure came despite it not being a vintage performance from the Croft Park side. “I thought we were pretty poor in the first half, “he said. “We missed a few chances and our confidence dropped a touch, which is understandable. “Matlock came to slow the game down and prevent us playing at our preferred tempo. They were right to do it, although we did show good character after the break and were able to press forward better. “At times like these in a season and in games like this, it’s not always possible to play expansive football, you just have to look for fight and endeavour. “There’s pressure on us all at the moment – players and fans. “We had a young side out at the weekend and pressure is something they’re going to have to get used to as their careers progress. There is no game for Blyth during the week, allowing Wade to prepare for a busy Easter weekend, with Stamford first up. Then on Bank Holiday Monday Spartans entertain Workington at Croft Park, kick-off 3pm. Meanwhile Spartans’ date in the final of the Techflow Northumberland Senior Cup final at St James’ Park is Wednesday, May 4, kick-off 7.30pm, where they will play the winners of Wednesday night’s North Shields v Morpeth Town semi-final.